Over 70 articles on varied aspects of cycling, including an informational glossary of bicycle terms and meanings. Specialty framebuilder for standard and custom fixed gear framesets. Fixed gear bicycles for Road and Track. Sales of bicycles, parts and accessories plus outdoor gear in Dauphin. Offering an extensive line of bicycles, clothing, eyewear and protective gear, hydration systems, parts and accessories. Central New Jersey shop offering bicycles, adult and childrens tricycles, car racks, helmets, accessories, and BMX gear. Full service shop in Los Gatos. Carries Santa Cruz, Seven, Calfee, Independent Fab, Bianci, Ventana, Moots, and Kestrel. Clothing and gear, advice, fitting and directions. Bicycles and accessories for all ages. Plus, police bikes, exercise equipment and repair. Provides sales and service of new and used bicycles, located in Carrollton, Georgia. Quality bicycles, service and accessories for Indianapolis and Greenwood. Sells and repairs bicycles. Includes technical information. Reproduction Hiwheel Bicycles and Lowrider Bicycles. Dealer of bicycles and stationery bicycles. Located in Flemington, New Jersey. Bicycles, parts, and accessories for all levels of cycling, both locations on biking routes. Sales and service of quality bicycles, parts and accessories. Located in the San Francisco Bay area. Offers bicycles, service and accessories. South Glastonbury shop offering a selection of adult and child bicycles and accessories. Service for all brands. Offers bicycles and accessories, as well as repair of all makes and all ages of bicycles. Also includes collectibles, rides and racing information. Carries product lines such as: mountain, road, tandem, recumbent, multisport, folding and vintage bicycles. Links to photos, events, and directions. Specialize in bicycles for road cycling, road racing, touring, cross and hybrid bicycles. Discount bicycles for the entire family. Specializing in BMX bikes and mountain bikes. Sales, service, repairs and accessories. Located in Phoenix. Offers rental bicycles, services and sells Giant, Haro, Specialized and Titus bicycles. Links include events and sponsored team information. DeVore Bicycles is a full service bicycle outfitter with new bike offerings from Giant, Redline, Burly and Mosh in Columbus Ohio. Located in Alameda serving Oakland and Berkley cyclist with sales service and repair for road bicycles, mountain bicycles, and bmx bikes. Bike shop that accepts used bicycles for bike dump, also provides repairs. Site has parts, services, store information, photos and links. A small collection of classic bicycles, vintage bicycles, and project bikes. Retail sales for Gary Fisher, Bontrager, Univega, Electra and Raleigh bicycles. Offers bicycle rentals, auctions, accessories, and links to bicycle advocacy. Full service bicycle sales and repair shop located in the Dallas / Fort Worth area. Authorized dealer of Airborne, Bianchi, Santa Cruz, RedLine, MOOTS, Jamis, and Ellsworth bicycles. Offer a selection of recumbent bikes and trikes in Louisiana. KettWiesel, Voyager, EZ-3 Trike, Spirit, Rocket, Stratus, and Tour Easy. Used recumbent trikes and bicycles also available. Features Trek bicycles and accessories, LeMond, Gary Fisher, Klein, Haro, and Bianchi bicycles, along with custom hand built frames from Waterford Cycles. Hours of operation, service costs, and directions are provided. Based in Winfield. Features Trek bicycles and accessories, Lemond, Gary Fisher, Klein, Haro, and Bianchi bicycles, along with custom hand built frames from Waterford Cycles. Hours of operation, service costs, and directions are provided. Locations in Cleveland Heights and Mentor. Selling Raleigh, Schwinn, Torker, Haro and GT bicycles, Schwinn Exercisers and Fitness Equipment and Schwinn and Bowflex Treadmills. Service for all brands of bicycles. Ottawa bike shop that accepts used bicycles for bike dump, also provide bike shop services, repairs and sales. If the business hours of Sheldon Browns Cycling Articles in may vary on holidays like Valentine’s Day, Washington’s Birthday, St. Patrick’s Day, Easter, Easter eve and Mother’s day. We display standard opening hours and price ranges in our profile site. We recommend to check out sheldonbrown.com/articles.html for further information. 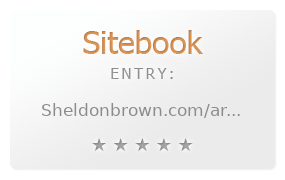 You can also search for Alternatives for sheldonbrown.com/articles.html on our Review Site Sitebook.org All trademarks are the property of their respective owners. If we should delete this entry, please send us a short E-Mail.